String pooling (sometimes also called as string canonicalisation) is a process of replacing several String objects with equal value but different identity with a single shared String object. This is the most basic and predominant concept that every Java developer should know. In this article, we understand the concept of pooling with the help of few examples. You can create objects of the class String by using the new operator, by using the assignment operator ( = ), or by enclosing a value within double quotes ( " ). But you may have noticed a big difference in how these objects are created, stored, and referred by Java. This image illustrates the previous code. In the previous code, a comparison of the String reference variables str1 and str2 prints false . The operator == compares the addresses of the objects referred to by the variables str1 and str2 . Even though these String objects store the same sequence of characters, they refer to separate objects that are stored at separate locations. Let’s create two String objects with the value "Latte" using the assignment operator ( = ). In the previous example, the variables str1 and str2 referred to different String objects, even if they were created using the same sequence of characters. In the case of variables str3 and str4, the objects are created and stored in a pool of String objects. 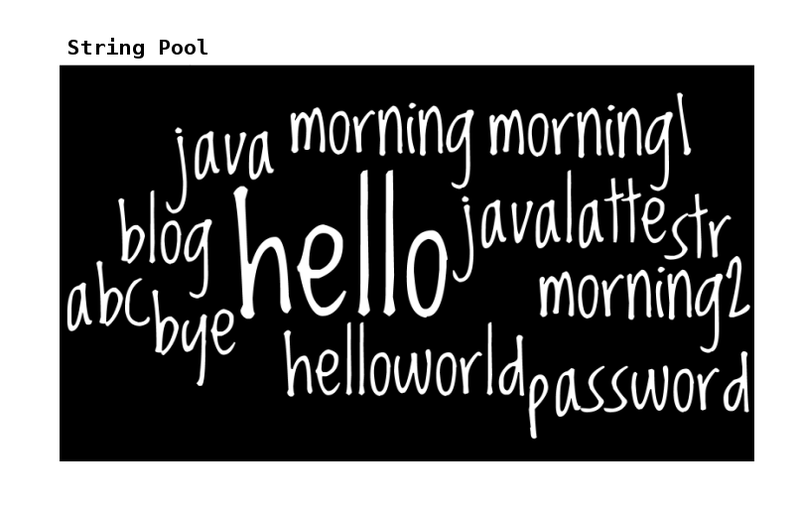 Before creating a new object in the pool, Java first searches for an object with similar contents. 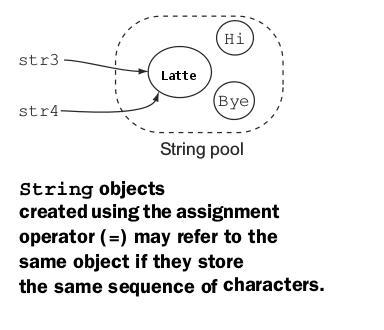 Java doesn’t create a new String object in this case, and the variable str4 refers to the existing String object "Latte". The preceding code shows that object references of String objects that exist in the String constant pool and object references of String objects that don’t exist in the String constant pool don’t refer to the same String object, even if they define the same String value. Note strings in the JVM string pool are eligible for garbage collection if there are no references to them from your program roots. It means that if your interned string went out of scope and there are no other references to it – it will be garbage collected from the JVM string pool. A pool of strings, initially empty, is maintained privately by the class String. When the intern method is invoked, if the pool already contains a string equal to this String object as determined by the equals(Object) method, then the string from the pool is returned. Otherwise, this String object is added to the pool and a reference to this String object is returned. String allocation, like any other object creation proves costly in time and memory.The JVM do some trickery while instantiating the string literals to increase performance and decrease memory overhead. To decease the number of creation of String object in JVM, the String class keeps a pool of Strings. Each time you create a string literal, the JVM checks the string literal pool first. If a string is found in the pool, a reference to the pooled string is return.if the String is not exist in the pool, a new string object is instantiates, then placed in the pool. Really its a great example on String pool, Thanks Pardeep, we are looking forward to hear you. Good example. Easy to follow. Does StringBuilder store its value in the String pool?